An exciting triangulation feature has just been released at 23andme. It is only for profiles that have transitioned to the new site and have selected open sharing (for now). The feature shows you the relatives you have in common with one other profile and whether or not they triangulate with the two of you. When there is a “Yes” in the right hand column, there is a DNA segment in common between the two people you are comparing and this third person thus you triangulate. A “No” means that although you each share DNA with this relative, there is no segment of DNA where all three of you match. Click on the Yes (or a No) to see the three of you compared in the chromosome browser. Sadly you cannot use this tool with relatives still on the old site, since they have not yet been able to opt in to “Open Sharing” yet. ← It’s almost time for Jamboree! Thanks Kitty (and Jason) for reporting this. 23andMe now joins GEDmatch as the only two companies to actually determine and report true Triangulated Groups. I’ve tried, for years, to get FTDNA to add a Yes/No to their ICW list, to no avail. And AncestryDNA remains way at the back of the pack on Triangulation. We’ve always had the ability to compare two kits (that share the same segment with us) to each other to determine Triangulation – the feature automates that process and makes it much easier. Come on FTDNA – without the ability to compare two matches against each other, the least you can do is just tell us Yes/No in the ICW list. The ability to compare two kits is at 23andMe, not AncestryDNA. FTDNA has an ICW feature, but it’s not as easy as the 23andMe option appears. I am still showing the message, “We will soon transition your account to the new 23andMe experience.” Any word on when the rest of us will get this? I got an email from 23andMe last week that said they hope to migrate my account by the end of August. But that email was for only one of my seven kits, so I dont know if they are all moving or what. Makes the process easy and straight forward….gives one hope that 23&me is still interested in those of us who use their service for genealogy…. I can’t follow the instructions. Probably, because my accounts have not been transitioned. Wonder when that will occur. Since receiving this post I have been using this 23&me feature and it seems quite good…..The major problem I have encountered is the lack of information concerning it……Many persons do not have OPEN SHARING turned on, thus it doesn’t work for them. Why doesn’t 23&me have an area to announce such changes? Without Kitty’s blog I would have never known of this….Oh, I know it is buried somewhere in the 23&me forums, but that doesn’t seem a very effective method of communicating to me…..so 23&me gets a big thumbs up for the new feature and a thumbs down for effective communication. Thanks for the report cousin-in-law Dennis! I am doing my presentation on Triangulation at the Jamboree first thing thursday morning so I will have to add this. I checked the 23andme blog and saw nothing on this. Jason Lee mentioned it in the ISOGG group on facebook so then I blogged about it. As I am very new to DNA, and I have been using GEDmatch to triangulate, I am happy to see this Triangulation feature in 23&me because it makes it so much easier to explain to my matches what is going on. Not everyone wants to deal with Triangulation at GEDmatch so this is a welcomed tool. I am new to 23&me so I can not compare to the “old” site. p.s. Because of this great triangulation tool, I was able to solve seven family matches in one afternoon ! Hi Kitty, Our DD is adopted from China. She and many other adopted children have done the 23andme DNA tests. She has 65 DNA relatives ranging from 3rd to 5th cousins. 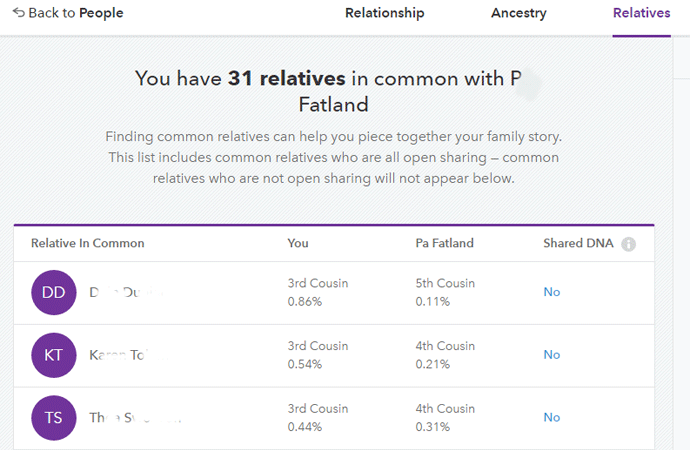 How can we use the 23andme “relatives in common” results to do a triangulation and eventually search for birth families? A couple of the adopted children were found in the same province as our DD. Other non adopted children and adults were from different provinces and or Taiwan or Korea. Should we create and Excel sheet with the names of the “relatives in common” with provinces and try to track some sort of migration? Are there tools to do this? We have uploaded information on GEDMatch and WeGene (Chinese database without DNA relatives’ information.) Your insight would be greatly appreciated. I really have no special insight on your search not having worked with Chinese adoptees but I would be happy to help out. Your approach sounds good to me. I assume you have been to DNA adoption and posed this question to the group at the Yahoo DNA-adoption mailing list? Or over at DNA detectives on Facebook? Ther may be some people there who have more experience with this. Use my contact form to send me any specific questions that you think I might help with and to keep me posted. I will pass this along to my friends at DNA adoption in case they know of someone who works in this area.